AUTOMOTIVE NEWS: Toyota's U.S. market share is about 14 percent, down from a high of 17 percent in 2009. What is the appropriate level? AKIO TOYODA: Rather than figures, taking care of the customer and building ever-better and exciting cars are our top priorities. Sustainable growth comes as a result of success in these areas. Jim Lentz, our North America CEO, shares this approach. I'm very happy with the job he's doing. President Akio Toyoda says Toyota Motor Corp. is finally ready to go on the offensive again, after being hobbled in recent years by such crises as the global financial meltdown following the collapse of Lehman Brothers, unintended acceleration recalls and Japan's killer earthquake. Toyota is on the cusp of selling 10 million vehicles a year, which would make it the first carmaker to achieve that milestone, he says. But raw volume is not his goal. Instead, it will be a byproduct of what Toyoda says is a back-to-basics refocus on human resource development, better product and innovative manufacturing. 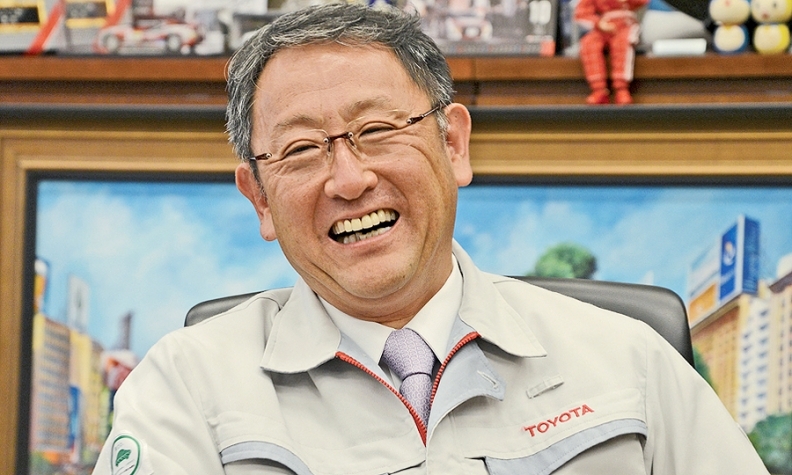 Toyoda, 57, spoke through an interpreter with Asia Editor Hans Greimel about going on the offensive again, Scion and the Toyota New Global Architecture, or TNGA, a new modular development strategy that will deliver its first vehicle in 2015. Q: You have said Toyota is ready to go on the offensive. Does that mean you are ready to begin building factories again? A: When you hear "offensive," you may think that equals increased volume. But volume is only one element. What I mean entails our competitiveness and growth in our manufacturing know-how. Toyota has come close to nearly 10 million units a year. No carmaker worldwide has exceeded the 10 million unit sales mark. But at today's Toyota, we are not pursuing volume. Going on the offensive means making ever-better cars and changing the way in which we produce cars. We expect to see a totally changed landscape in our plants. In the past four years, we have experienced many challenges. One of the themes I repeatedly brought up was that our expansion in volume outpaced our development of human resources. We have entered this offensive stage trying to nurture people who can think about and understand what it really means to have competitiveness and sustainable growth. So you are not targeting 10 million unit sales? That will be the result. It's not our ultimate goal. I don't really agree with the idea that being No. 1 means having the biggest volume. When I talk about that, for example at dealer conventions in the United States, it's received very well by them. They have multiple franchises in the United States, and many of them tell me, "The kind of things you say, we never hear from other automakers." I may be unique in that sense. But unless you are successful in making cars one by one for each customer, you can't be successful on an aggregate level. Scion is losing traction. What are you telling dealers? We will continue with Scion. But Toyota has limited resources. There are needs [that Toyota faces] on the part of Scion, environmentally friendly cars, Lexus, for trucks. I have been telling them they will have to wait a few years. Some just don't want to wait. But I have been telling them I will continue with Scion. It's a matter of whether dealers trust my word to wait. What should they be waiting for? The concept of the Scion has changed since its launch. It was supposed to do what the Toyota brand couldn't. We are trying to come back to basics for Scion as well. Scion was launched as a unique brand. But after a while it started selling greater volume. That can be done by Toyota. We wanted to attract customers who weren't satisfied by Toyota or who might be future Toyota customers. How would you rate the company's progress on your blueprint for a better company during your four years as president? Rather than drawing a blueprint, what I have done is to clarify what is expected from Toyota as a company. All I have said is, "Let's make ever-better cars" and "Let's pursue sustainable growth." Or "Let's become a stronger company so we can make a contribution to society at large." I think getting back to basics better represents what we are doing. If people perceive that we are trying to become a new company based upon some blueprint, that means that Toyota has somehow drifted away from the course it has pursued in the past. Employees engaged in those activities are beginning to understand that we had drifted away from the central course. How much is left to do to correct the course? It's like kaizen, or continuous improvement. You never reach a final stage. The key is making tomorrow better than today. After the kaizen is also before the kaizen; when one improvement is finished, it is the beginning of the next improvement. Eiji Toyoda, perhaps the company's most formative president, recently passed away. What lessons do you draw from him? He passed away at age 100, and Toyota's history spans 75 years. The history of Eiji was the history of Toyota itself. There is no one who can take his place. What I learned from him came from observing his career; he is a historic figure. He was not my direct mentor, nor was my father [Shoichiro Toyoda], the honorary chairman. They didn't give me direct instructions, like I should do that or do this. But after the U.S. Congressional hearings, they both said that the fact that I apologized on that occasion shows how I represent Toyota in the past, present and in the future. They said the apology was also for all the suppliers and all the dealers working for Toyota, toward all our customers. That input from those two figures had huge impact. I think they both felt that they passed the baton to me as the person responsible for the entire company. How far have you come in transforming Toyota's image into a more fun-to-drive brand? I have always said two things: Please make ever-better cars. And if it doesn't offer fun, then it is not a car. Our executive vice presidents and others took that message and said, "Why just rely on hard work and effort? Why don't we make these cars smarter?" And the answer was TNGA. Under TNGA we try to consolidate platforms across many different models. So if cars are based on similar concepts, they can use a common platform. Will that be a turning point to allow capacity expansion? Prior to the Lehman crisis, we really depended on employees' hard work to achieve the level of volume we actually produced. If I may use the analogy of an athlete, it's like he spent more time in actual competitions, rather than enough time in training, being given challenging targets to attain. What we are doing right now is enhancing the physical flexibility of those athletes. We are putting on muscle. But when they say, "We want to enter the competition," we tell them to wait for a while. That's where we are right now.